In Giuseppe Tornatore’s The Legend of 1900, after an abandoned baby is left aboard a great ocean liner, he spends the rest of his life at sea. And although he’s tempted by love, as an adult, “1900” (Tim Roth) finds himself unable to leave the vessel that has become his home. While 1900’s oceanic landscape endlessly changed as the ship moved from port to port and his circumstances were played for melancholic fairy tale like whimsy in Tornatore’s period piece, in four-time Emmy nominated director Lee Shallat Chemel’s feature film debut Greener Mountains, we’re offered a similar set-up but a decidedly sunnier approach. In Chemel’s contemporary, warmly inviting film, although the equally abandoned child JP Barton (Chris Heuisler) has also lived in the same location where he was discovered and for him the view never changes, after only a few introductory, gorgeously photographed shots, we realize that compared to 1900, he’s living in a far more idyllic situation. Set amidst the breathtakingly picturesque Vermont setting of Barton’s Family Resort, we instantly recall Chemel’s other television credits working in other welcoming communities such as Gilmore Girls’ Stars Hollow and Northern Exposure’s Cicely, Alaska. After a cinematographic dream of a credit sequence in which any single frame could be pulled out and turned into a postcard, we’re introduced to the now college-aged JP who nearly runs the resort alongside his best friend, caretaker and the only family he’s ever known, Barton’s owner M (Nan Martin) who also narrates the film. While M’s slightly clichéd narration and the film’s frequent, confusing, and poorly transitioned over-reliance on flashbacks do pull us out of the film at times, it’s such an engaging, appealing, and refreshingly wholesome summer sleeper that those who are willing to overlook the contrivances will find themselves entertained. 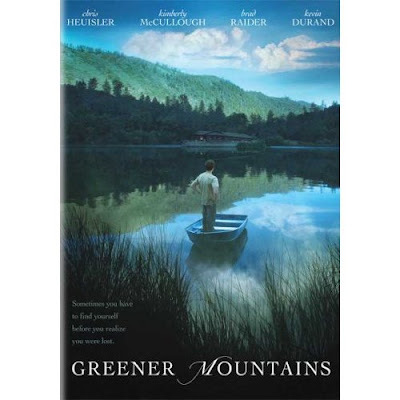 An ideal family film that seems like a perfect programming choice for a cable family or teen based network, Greener Mountains evolves into a romantic coming of age tale as the sweet-natured JP finds himself questioning his limited existence when the lovely Alice (General Hospital’s Kimberly McCullough) arrives from New York, hoping for artistic inspiration and an escape from a recent breakup. Naturally, JP is drawn to the young painter but fears that the true details of his life would fail to impress a brainy city girl. So, predictably, especially for the romantic comedy paradigm which lately has favored the mistaken identity plot device, completely head over heels and willing to do anything to win her heart, he proceeds to fabricate an entire back-story about himself, trying to pass as an NYU student specializing in environmental architecture. Enlisting the aid of a friend in giving him a crash course on artistic masterpieces and Manhattan geography, JP and Alice grow much closer but their fledging relationship is threatened with the arrival of his manipulative, scheming, smugly handsome and conceited relative Eric (Brad Raider). Essentially playing a Rob Lowe type versus Alice’s likable Alyssa Milano-like presence and JP’s easily winning, boyish Jake Gyllenhaal demeanor, we realize it’s only a matter of time before Eric — M’s grandson and JP’s adopted uncle — draws a wedge between the two. And although we sense he’s felt a certain rivalry and jealousy with the adopted and universally preferred and loyal JP, Eric’s true motives are revealed later on as we realize that he’s even more obsessed with the elderly M’s failing health and the future of the resort, which pushes the romance to the back burner as JP realizes not only how much is at stake but must make some tough decisions about his own future and just what he considers to be important in his life. Respecting the intelligence of the audience who have faced several “lying lovers” and “spoiled schemers” plots, writer Hector Hill and director Chemel enrich what could have been an overly formulaic script by filling out the rest of the cast with some great supporting scene stealers including Christopher Guest alumni Michael Hitchcock as well as a nice parallel between the main story and the resort’s annual production of William Shakespeare’s A Midsummer Night’s Dream. Despite a small screen feel, Greener Mountains is painterly photographed quality fare from Waterfall Films, which recently made its debut on DVD after earning a Jury Award at the Boston International Film Festival.